Have a tattoo that you regret? You've come to the right place. It might be a flower that had been done incorrectly. It might be the name of a former lover haunting you on your lower back. It might even be something that had been done during a wild night in Vegas. Many people struggle with the same regret. A tattoo has gone wrong. How many times have you wished that you could just erase that ugly tattoo? Luckily with the advancements in laser technology, you can get rid of your unwanted tattoo with the help of laser tattoo removal! At the York Medical Spa, we pride ourselves in putting our clients first! We’ll get rid of that ugly tattoo that you regret. The procedure is quick and you’ll be surprised with the results! We use advanced laser equipment which enables us to be absolutely precise during the entire procedure. There is no room for mistakes with us and you can count on professional, affordable service. All our medical experts have been fully trained to understand how laser tattoo removal works and to pinpoint the best way to successfully remove the tattoo with minimal scarring. With us, a tattoo doesn’t have to be permanent and we make it easy for you to forget about it. Before the procedure can start we will have to prepare you. We’ll size up the area that we need to target. We’ll make sure that our team of medical professionals educate you on the procedure so that you understand what the procedure entails and will make sure that you are 100% ready to have that tattoo removed. We will develop a specific treatment plan based on the size of the tattoo, the color of the tattoo and the position thereof on your body. During the procedure, a small laser beam is emitted from a high tech device. We pinpoint and target the problematic area. This laser beam penetrates the layer of the skin where the ink has been settled. This process destroys the tattoo from the inside out. We can remove black ink more easily since it is broken down by any type of wavelength. However, color tattoos won’t be a problem either. We do have numerous types of laser beams available that will emit the right type of wavelength to destroy the colors on your skin. After the treatment, we will make sure that we inform you of how to take care of the treated area. We’ll educate you on how to protect the area from any type of harm. You might have to come back for a follow-up appointment just to see that you are healing properly. 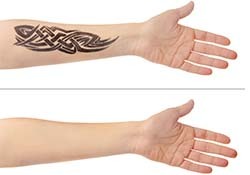 You can start the laser tattoo removal journey by making an appointment today. Phone us or fill out our online appointment form to book your slot as soon as possible!